When you think of World Class Italian Wines most people even if they are in the Restaurant Business think of the Grape Sangiovese from Tuscany which produces famous wines as Chianti and Brunello Di Montalcino and Nebbiolo which produces the famous wines in the Northwest region of Piemonte such as Barolo, Barbaresco and Gattinara. As much as I love these wines as much as the next Italian Wine Lover for me the greatest Italian Wine and Best Bang For The Buck has always been made from the Aglianico grape in Campania called Taurasi. AGLIANCO is one of those fun grape names that will make a Gringo Wine Guy like me think I am speaking Italian. Aglianico…phonetically pronounced (AHHH–GLEE- ON-ICKO) Say it!! See doesn’t it sound like you are speaking Italian. 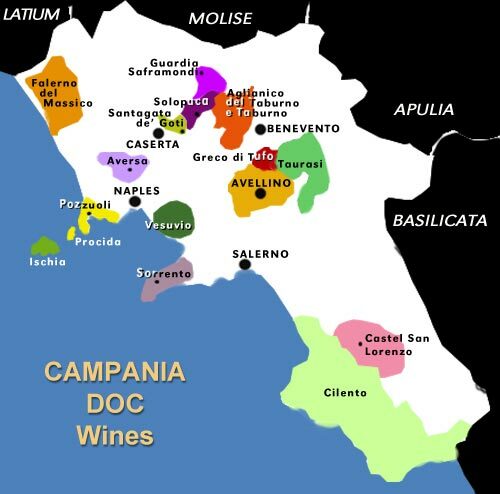 This is a map of the DOC and DOCG Wine Producing areas in Campania. Like many of Italy’s Wine producing regions, Campania’s DOC AND DOCG come from Greek and Roman influence, it’s origin dating back as far as 800 BC. Taurasi is located 31 Miles Northeast of Naples in the hills of Avellino where the AGLIANICO (I LOVE SAYING THAT GRAPE NAME) derived from the Greek name ELLENICO (NOT AS MUCH FUN TO SAY). Once again like the Greek Varietal we spoke about in a previous post GRECO DI TUFO it is all about the TERROIR. Taurasi is 1300 feet above sea level but the soil is all about the Volcanoes. Those Volcanic Deposits and Limestone are the key to the flavors that make these wines so Amazing. The main reason most Italian Wine Lovers have never tried a Taurasi or ever heard of the grape Agliancio is because it is very difficult to find. I haven’t had one here in Florida in almost 8 years because you never see it. In Florida I had no worries however. I knew one day, my favorite Italian Wine Importer Alberello Imports and the Selections of Nadia Galati would come to the rescue to introduce Floridians to this Amazing World Class Wine. Recognized as a DOC in the 1970s and then receiving the Higher Status Of DOCG in 1993 Taurasi must contain at least 85% Agliancio. 15% can be Piedirosso or Barbera or Sangiovese. Taurasi must be aged 3 years. 1 year in Oak Barrels and 2 years in the Bottle. A Riserva must be aged one extra year in Oak. 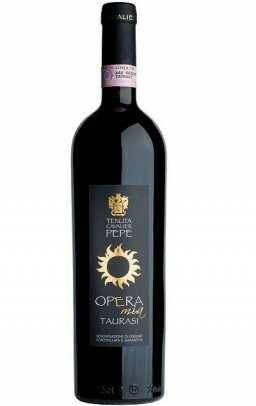 The 2007 Tenuta Cavalier Pepe Taurasi Opera Mia brought into Florida by Importer Nadia Galati is probably the best Taurasi I have tasted in my CAREER!! This is 100% Aglianico.The grapes are harvested by hand during the first week of November, are selected in the cellar. Part of a cold pre-fermentation maceration to optimize the extraction of color and fruity aromas. Follows the alcoholic fermentation with a long maceration on the skins. After the wine is racked into French oak barriques, which refines and softens for at least 12 months, until the aging in bottle for a further 12 months. The nose like all Taurasi coming from that VOLCANIC SOIL is Smokey and Meaty and Cherry meets Prunes. On The Palate just silky full bodied macerated cherries, a little dried Prunes (Don’t ask me how I know what Prunes taste like it’s a personal issue) BAROLO like traits of leather and crushed flowers and firm tannin grip. I have always felt that Taurasi is the Epitome of ITALIAN WINE. When you think Of BAROLOS you think Of BIG BUCKS as Well. This TAURASI retails in Florida for $39.99!!! I would have paid $65 or more. It’s just THAT GOOD!! If you live in Florida you can contact me and I will tell you where to find this wine and I can also tell you there isn’t much to go around. If not, insist your local Wine Merchant bring in a quality Taurasi so you can experience THE BAROLO OF THE SOUTH. OK ONE LAST TIME FOR FUN…..AGLIANICO!! !